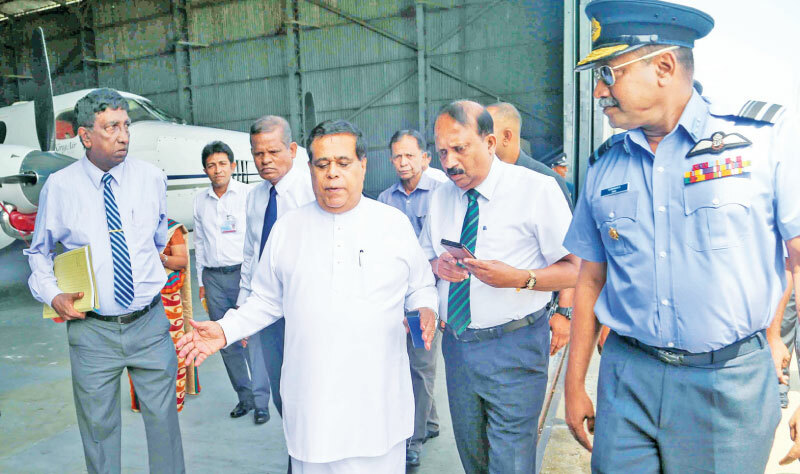 The government has a master plan to upgrade the Ratmalana Airport as an efficient domestic and international Airport, Transport and Civil Aviation Minister Nimal Siripala de Silva said. Under the master plan several major capital development projects including the construction of a new taxiway and overlay area, the upgrading of terminal facilities, the renovation of hangars, and to set up a new air traffic control tower will be undertaken. Addressing the media after participating in an inspection tour of the airport yesterday, the minister said that the Sri Lanka Air Force has agreed to provide 25 acres of its land for the development of the airport. The Civil Aviation Authority has already paid Rs. 725 million to relocate two hangers and the administrative complex of the Air Force. Construction of the two hangers and the administrative complex for the Air Force is underway. According to the minister, the cost is Rs.1,479 million; Rs.829 million of the total cost will be spent by Airport and Aviation Services (Sri Lanka) Limited, while the Civil Aviation Authority will spend Rs.650 million. The minister said the Ratmalana Airport, the first international airport in Sri Lanka, was operating as the major international airport up to 1969. With the upgrade of the airport, the country would be able to train more pilots, he said, adding that there is a huge demand for pilots across the world. “With the completion of the Colombo Port City project, we are planning to use Ratmalana airport to provide services to foreign private jets and small aircraft,” Minister De Silva said. Tagged Gossip, Sri Lanka, Sri Lanka News, srilankatravel. Bookmark the permalink.